Indonesia stretches across the Malay Volcanic Belt and due to its peculiar and fantastic nature, its complex variety of peoples, and its fabulous richness, it is one of the most fascinating regions on earth and offers unrivalled experiences for both divers and non-divers alike. Located in the Lesser Sunda Isles (also known as Nusa Tenggara) at the eastern end of the vast archipelago of Indonesia lies Bali, the Island of the Gods. Bali is one of the most renowned islands of Indonesia both for its magnificent diving and atmospheric cultural festivities. The island is intoxicating with its warm tropical climate, breathtaking views over active volcanoes, tranquil mountain lakes, verdant rice terraces and a stunning coastline of white sands being gently lapped with crystal blue water. Bali's immediate proximity to deep water and exposure to currents coming in from the south, enriches the waters with nutrients enabling a lavish profusion of marine life. Shimmering reefs, spectacular drop offs and historical underwater wrecks make Bali an exhilarating experience for both beginners and the more adventurous diver. Most diving is shore-based and because of the close proximity of the reefs and deep water all sites are accessible within a 20 minute boat ride, the more prolific dive sites being on the north and northeastern coast. The WWII wreck, US Liberty, is located at Tulamben on the northeast coast of the island. She lies just 30m from the shore and is encrusted with soft corals, sponges, oysters and crinoids, a diverse marine habitat of her own. On approaching the wreck divers are welcomed by a marine committee of parrotfish, sergeant fish and the resident school of jacks. The waters here are abundant with life, you will see groupers, stingrays, trumpet fish, bannerfish, and a variety of pufferfish. The soft corals and anemones teem with clown fish, gobies and blennies. Further from the wreck the sandy slope with low-lying reef attracts different species, this is where you can see octopus, moray eels and shrimp before the reef plunges in a drop-off that is adorned with hard corals, sea fans and sponges. As a night dive this site is fascinating, the phosphorescence lit by the moon sparkles around the wreck creating an eerie but beautiful scene of history. To the southeast of Tulamben, the dive sites around Amed and Gili Tepekong offer ecstatic dives with underwater profiles ranging from drop-offs, sheer walls, trenches, canyons and pinnacles where both Nurse Sharks and reef sharks can often be seen. Just off the northwest coast lies Menjangan Island, inevitably one of Bali's prime dive locations offering peerless diving off seraphic coral reefs. Menjangen Island is located in the beautiful West Bali National Marine Park and is only a boat ride away from the coastal village of Labuhan Lalang. Although the flat reefs of this area have previously been subjected to dynamite fishing, much anchor damage and coral-eating Crown of Thorns Starfish, the re growth can now clearly be seen. Menjangan is mostly famous for its exceptional wall dives and fortunately these have not been damaged, they start at a depth of 26m and descend to 60m. Macro diving enthusiasts should explore the shallow reefs of Secret Bay which lies in the strait that separates Bali from Java. This exquisite bay forms a catchment area for juvenile species as nutrient rich waters flow through and there are few pelagics due to the reef being only 3-12m deep. For those divers wanting to encounter larger pelagics, the island Nusa Penida should be visited. This small island is located off the southeast coast of Bali and offers a wealth of fantastic drift dives. The reef terrace is at a depth of approximately 12m and falls away to a depth of 600m, for the more experienced divers drift diving along this wall is an exhilarating experience. Manta Rays, turtles and the occasional Mola-mola can be seen weaving their way through the teeming schools of sweetlips, bannerfish and groupers. The hard corals here are in pristine condition, often interspersed with vibrant soft corals and sponges. The resort is situated on a private island which is approximately 3 miles from the coast of North Sulawesi . The Island of Gangga is the first of an archipelago of small islands, many of which are still unexplored, connecting Indonesia to the Philippines . The canal that separates Gangga with the mainland is the one that unites the Pacific Ocean with the Indian Ocean and that is why this place is considered one of the worlds best environments for crystal clear waters and the underwater life. The closest city is Manado , at a distance from Gangga of one hour by car and 30 minutes by boat. 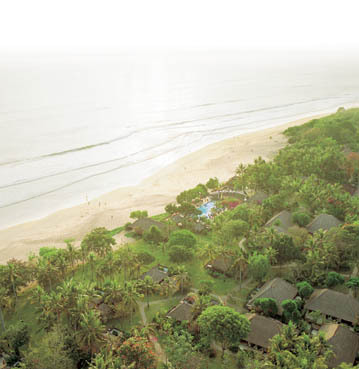 Located on the north eastern coast of Bali and at the foothill of the island’s most important landmark Mt. Agung , home to Pura Besakih, Bali ’s mother temple. The small village of Tulamben is rather unremarkable at first glance. Its beach is a spread of black sand covered by smooth, fist-size rocks. Like all the north coast villages, there are no lush rice fields here- Mt Agung and the other mountains steal the rain, which come from moisture-laden air that blows in from the south. What brings people to Tulamben however, is not visible from above water. People come here to dive and explore the fantastic underwater world of Tulamben Bay. 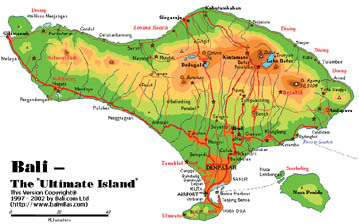 The island is part of the Bali Barat National Park , a protected reserve area that encompasses 780 square kilometres. The name Menjangan means “deer”. Because the island is an protected position, currents and wind generate waves are rarely a bother. The island is surrounded by pleasant white sand beach. Coral formations close to the shore are good for scuba diving and snorkelling as well. Manado is the centre of Minahasa and is the capital of North Sulawesi , and faces BunakenMarine Park in the Celbes Sea , comprising 5 islands surrounded by spectacular coral reefs. North Sulawesi is famous for its amazing Nature. Active volcanoes, pristine jungle, endemic monkeys. But North Sulawesi ’s best heritage is its bewildering marine life. Stretched in the world’s area with highest marine biodiversity. A 12 km long canal divides the coast from the Island of Lembeh , and due to particular current movements and sediment rich in nutrients, it is home to strange and numerous marine creatures. Lembeh is considered a paradise for macro-photography, plankton rich water creates nutrients for some small and rare creatures. Often the plankton means that visibility is reduced, and the sea-bed is formed from volcanic sand, alternating with coral formations in mainly soft coral, which create perfect hiding places for the marine life. These unusual dives, which are often considered muck dives, offer the photographer the best chance to meet some mysterious creatures like Pigmy seahorse, frog fish, hairy frogfish, Cockatoo wasp-fish, blue ribbon eel, mandarin fish, leaf scorpion fish, nudibranchs and some rarity like themimetic octopus. Discovered only few years a go. It is also known as one of the best dive sites in the world amongst world photographers and marine biologist. Diving World, 23 A Kenilworth Gardens, Hayes, Middlesex, UB4 0AY, United Kingdom.